With so much discussion in the news about drawing down the United States military in Afghanistan, it might be easy to forget there are still American troops fighting there. Ann Walsh, the coordinator of Windsor, Connecticut’s “SEND” which stands for “Send Hometown Windsor to the Troops” is appealing to citizens to remember them, especially during the holiday season. At businesses throughout Connecticut’s oldest town “A Windsor Soldier’s Jar” can be found. 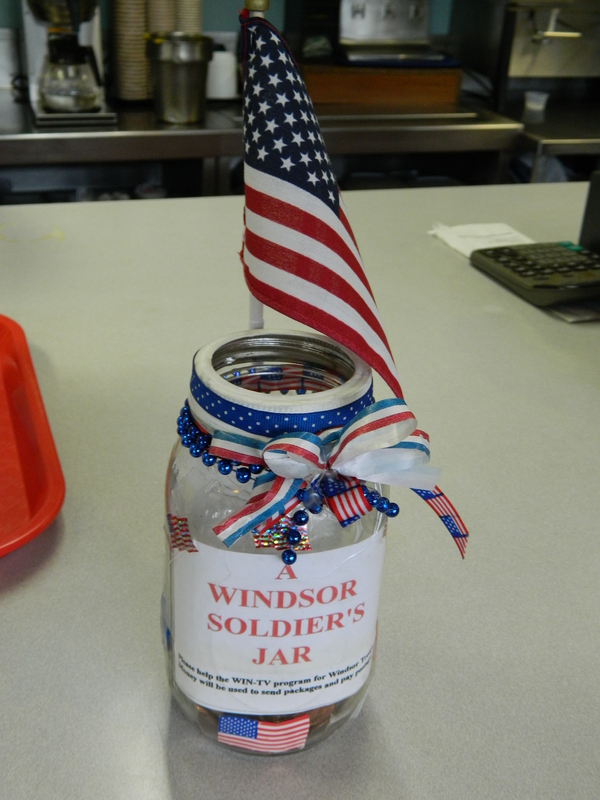 The coins placed in those jars helps pay postage for the care packages mailed to American troops still in the Middle East war zones; SEND has gone from a high of 33 soldiers once stationed in war zones down to the current number of nine Windsor-related men and women. Over a nine year period, some 150 soldiers have received packages from SEND, according to Walsh. One of the wonderful things about SEND is that thanks to the way Walsh coordinates this community service program of WIN-TV, it is not limited to the boundaries of Windsor. Inspired by the book “Christmas Jars” by Jason F. Wright, the soldier collection jars were suggested three years ago by June Lousteau and Betty McGee both of Windsor, who also decorate the jars with red, white and blue ribbons. SEND boxes are mailed out each month and have been for the last nine years, with the cost averaging $250 to $300 a month. No town, state, federal or WIN-TV money goes to cover the postage cost, rather is relies on donations. Currently, SEND is in need of postage funds particularly because Walsh mails extra boxes during the holidays in case there are soldiers who are not receiving anything from home – so they too will not be forgotten. Tax-deductible donations can be mailed to WIN-TV, 599 Matianuck Ave. Windsor, CT 06095 – be sure to include a memo – TROOPS.